The all-new full-sized Chevrolet looks and performs beyond its mass-market league. The last time General Motors (GM) redesigned the Chevrolet Impala the goal seemed to be to create as dull and forgettable a car as possible. In that sense, the Impala was a major success. Few cars were as boring to drive or, once seen, faded from the mind so quickly. 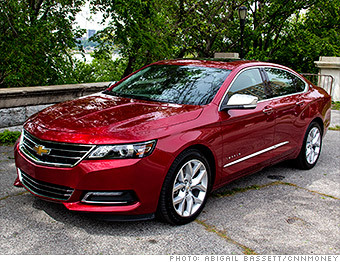 Following that performance, the new 2014 Chevrolet Impala is as startling as a splash of ice water to the face. For starters, just look at it. Far from bland and generic, its design is actually striking. You might like it, you might not. But it doesn't look like "just a car." It's also considerably larger than the old Impala. But wait until you drive it. If the appearance is memorable, the way this car drives is a revelation. The Impala comports itself like a machine costing far more. It handles well, rides nicely and accelerates with surprising grace and power. Perhaps the most amazing thing about the Impala is the fact that, despite being larger and far better, in virtually every way, than the old Impala, this one costs only about $1,000 more. Read on for the details.